The saying patience is a virtue comes to mind when we are writing this review. When The Hackers Paradise announced it was going to be doing a review on this apparel line, the flood gates opened. Hundreds of emails from people saying “we cannot wait” and “Hurry” are what we received so to not let our fans down, we got this one done quickly. Most of the THP readers know that I am a golf clothing NUT! To take that one step further, I am also a “crazy” golf clothing nut. One brand stands out among the rest and screams to me each and every time I open the closet and play golf. SubSeventy! THP wanted to reach out to them and discuss the line, so we went right to the source and spoke with Steve Chanen who handles their U.S. distribution. 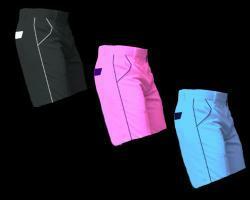 Subseventy designs an ultra funky selection of clothing that will give you the ultimate golf outfit. 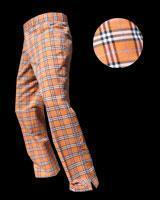 Looking good is all part of the game for the new breed of golfer. SubSeventy Golf clothing started in 2004. They wanted to produce a range of golf clothing that would inspire and excite customers. Taking golf fashion to the next level and offering some of the best clothing on the market. After speaking with Steve on the phone he was kind enough to send a couple of pieces over for us to take on a test drive. After a few days of waiting a package arrived and in it was clothing NIRVANA. I will relate this back to a movie from a few years ago. In the movie Pulp Fiction there was a scene in which they (Travolta & Jackson) open up the briefcase and from the back all you see is a glow. That is EXACTLY what I felt the day I opened up this package. Grinning from ear to ear, I managed to atleast open the box and remove the clothing. All I could think to do was to quickly photograph it so that the daily readers could see what I was dealing with. Now everybody knows that reads this site that we give away to our members of the forum just about everything that comes in to be reviewed. Here is a hint on what we keep (these clothes)! So my shots of unpackaging are going to quickly turn into shots of jealousy. In our “care package” from SubSeventy we received some pants, a few shirts, a pair of shorts, and a belt. Here comes the humiliating truth. I wore 4 outfits the day the clothes came in. Not just trying them on, mind you. I actually wore four different outfits during the first day. I could not get enough of these clothes. Now to be fair, not everything they sent was my size so their will be a select few forum readers that win some of the nicest clothing around. But I assure you had it all fit, I would have slept in them I like them so much. From the classic design of their logo, to the European cut of their clothing, everything about these clothes says top notch. They are made well and are classy enough to still be traditional and different enough to be flashy. The picture directly above is one of the shirts that was sent. It is my go to shirt for golf now. The first day I play after laundry, this shirt is worn. Classic Argyle yet with flare. All the shirts are made of performance material so you will not have to worry about that thick cotton look or feel. I have received more compliments wearing this shirt on the course than any other shirt I have owned or reviewed. Simple design is what separates them from the rest. The small addition of piping on the shorts makes them stand out the way ordinary shorts make you look plain. The Tailored shorts are available in so many colors I was ready to head out for a bank loan. But the thing that made them even better is that you get to customize your own. You pick the color of the shorts and you pick the piping. They have also added a colored flap on the back pocket to match the piping that you choose. Best of all, they are the most comfortable shorts I have ever played golf in. When ordering, keep in mind that they will take a couple of weeks since they are all custom made. For weeks you have listened to our ramblings about belts and belt buckles so one more will not kill you. 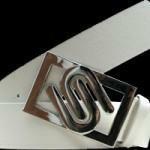 This belt is GORGEOUS. 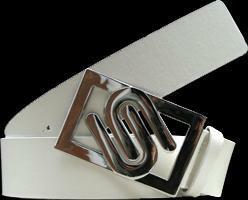 From the chrome looking buckle to the white leather belt it is a thing to behold. It is also available in quite a few colors. As I finish writing this I realize that I sound more like salesman and less like a reviewer. I am waiting to here the classic catch phrase “Billy Maze Here” to come out of my mouth since this review has turned into more of an advertisement. But the truth is when you find something that works for you so well, putting it into words is harder than you think. Subseventy is that way for me. Their clothing fits all my criteria for me to tell you it is MUST HAVE! I strongly recommend each and every reader give them a try. You will not be let down. You can take a look at all of their products at SubSeventy. Really nice Euro style about them. Not your traditional ‘boring’ looking golf wear. Love, love, LOVE that argyle–I’m always looking for classic with a twist. The belt is amazing. I too have that belt, I have a white and black. One little tip I must give you all, is the buckle scratches pretty easily. Obviously it will, if you look very closely you will see scratches, so if you are concerned about keeping this belt in tip top shape, watch what you do with it. My husband will definately be getting some of this stuff for Christmas. I had not heard of Subseventy, but after taking a look through their site I was blown away. I own one shirt of theirs and it is my favorite. I had not seen the pants or shorts but will definately be ordering some after the holidays. The piping is perfect. I am in love with that belt. The reviewer obviously is a little biased based on his taste for these clothes, but their stuff seems pretty cool. Prices are not out of line either. Can you get them in stores? I had never heard of them before this review. I wear a lot of J. Lindeberg stuff and this line looks very similar. I will have to give them a shot this year and see if the review is true. Best golf clothes made hands down. I own a hat from there and a shirt and both are the best I have. I have that same belt that was reviewed in the article. I wear it almost every time I play. I have asked for more for Christmas so hopefully Santa (my mom) brings it to me. I will own that red shirt before the end of the month. I am in love with those orange pants. I might have to give in and buy them. These are the nicest clothes I have seen yet. That red shirt with the argyle pattern is great. Can we get these in stores or online only? By far the best clothing for golf made right now. Another website bashes them, but that site is a joke at this point. Thanks for the great review. It makes me want those orange pants. 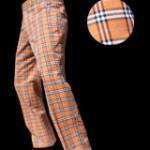 I cannot pull off the plaid pants, but the shorts with piping sound great. Im an impulse buyer, so the extra wait for the shorts might be an issue, but I really want to try these. I am going to get my son some of the shorts for Christmas. If they made women’s clothes I would be all over these. If they made women’s clothes I would definately get some. I guess I will get my hubby something from there though. The clothes are very European looking. I like it. Do you know if this stuff ever goes on sale? I wanted to get a shirt and pants for my husband. We love Pahr Golf since you have reviewed that and this stuff looks great as well. Placing an order for my husband this week. This stuff is great. Great reveiw JB… Great clothes as well.